China has saved the pandas! 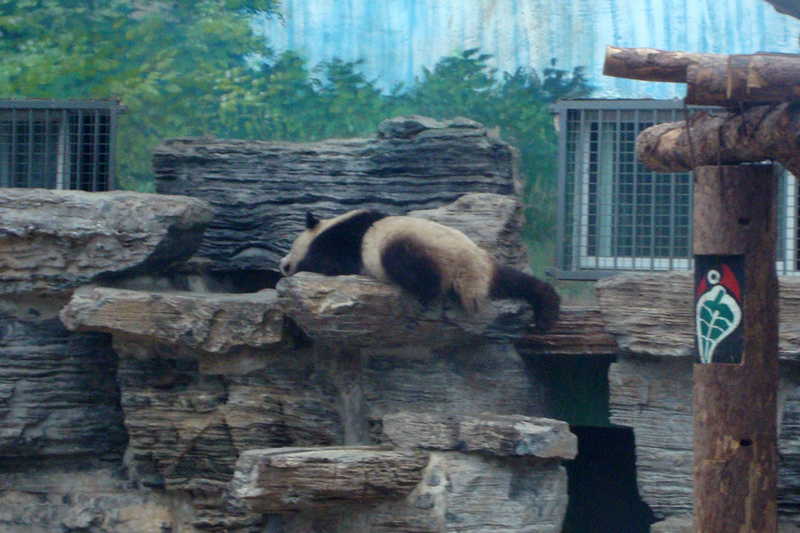 The giant panda is no longer an endangered species. The International Union for Conservation of Nature Red List of Threatened Species downgraded (upgraded?) the status of the much-adored creatures to “vulnerable” on Sunday, citing a 17% increase of pandas in the wild from 2004 to 2014. That’s actually fewer than 300 more pandas in a 10-year span, but I guess it’s progress for an animal that’s too lazy to live. Anyway, hats off to all those wild pandas that participated in the census. And congratulations to China, which stopped mowing down the bamboo forests to make this happen! China is hosting the G20 this year in the beautiful tourist (don’t forget high-tech) city of Hangzhou. As with any event where international leaders gather in China, it’s a huge deal for the CCP. Everything is under control. Authorities have sent all residents out of town. Shops are closed, the streets emptied. Construction has stopped and surrounding steel mills have also suspended production. The air is alright. It seems the measures taken by local authorities have made West Lake too unrealistically deserted. There are reports going around social media that authorities have started asking residents to come back out to make the prime tourist attraction seem more, well, attractive. There was a little snafu during President Obama’s arrival. The red carpet staircase wasn’t brought out, and there was no room for the White House press corps. But lest you think it was just a bit of mismanagement, some people, noting China’s absolute control over these orchestrated events, saw it as a highly coordinated, deliberate snub and show of power by China. It’s going to be a huge success! Update 8 September: And it was! A woman from Texas started speaking to me the other night. She started by wedging herself in between the wall and me and asking me if the bar we were at had any dessert. I pointed her to the food page of the English menu, copies of which we both had, and told her it doesn’t look like there was any. Disappointed, she started telling me how excited she was to be leaving in five days. I said it was a shame she didn’t have a better time in Beijing. We chatted a bit more, and then she said it. There was a moment of confusion, as I questioned myself whether I had heard her properly. “Sorry?” I asked her, giving her the benefit of the doubt. And that’s all I said to her about that. She then asked where I was from and I went through the whole spiel. We talked a bit about the US, my time in Beijing, her time in Beijing, why she didn’t like it. She seemed not the least bit embarrassed. She definitely didn’t apologize. Here I was, speaking to her in fluent English, using my standard American (slightly southern) accent, and she can’t even figure out that I must be American. I mean, I don’t know for sure why she didn’t pick up on that, but I think it’s because I’m not white. What does it take? If an American accent and normal American conversational skills are not enough, would geographical knowledge of the US help? Like, when she said she was from Texas, I knew where it was and how hot it gets there. And you know what? This wasn’t even the first time it’s happened to me. A lot of people are racist. You probably are too in some way. I know I’ve caught myself a few times. Racism manifests itself in surprising forms. Our biases come out unexpectedly: during conversations, while we’re out walking, in the choices we make. Our collective understanding of racism is still incomplete and imperfect, while we struggle, both individually and as a society, to know what it’s like to be part of or not part of a racial minority and how racism can affect all of us. But it’s more than stupidity. When your brain is too stupid to realize that someone who walks like an American and talks like an American is probably an American – you’ve clearly got a mental block preventing you from drawing the obvious conclusion. I’ve come to realize that that mental block is racism. Somewhere deep down, these people still link “American” with “white,” even though non-white people make up 25% of the US population and will soon make up a majority. But while I’m not personally offended by it, I do feel deeply about it. I’m outraged that there are still white Americans who do not see non-white Americans as Americans, and I’m worried about the societal repercussions this kind of thinking can bring. I think it can be dangerous. I won’t go into how here because it’s not the point of this post and I think it is pretty obvious by just looking at the current racial problems in the US. Disturbingly, some people claim that racism is dead. But it’s actually alive and well. 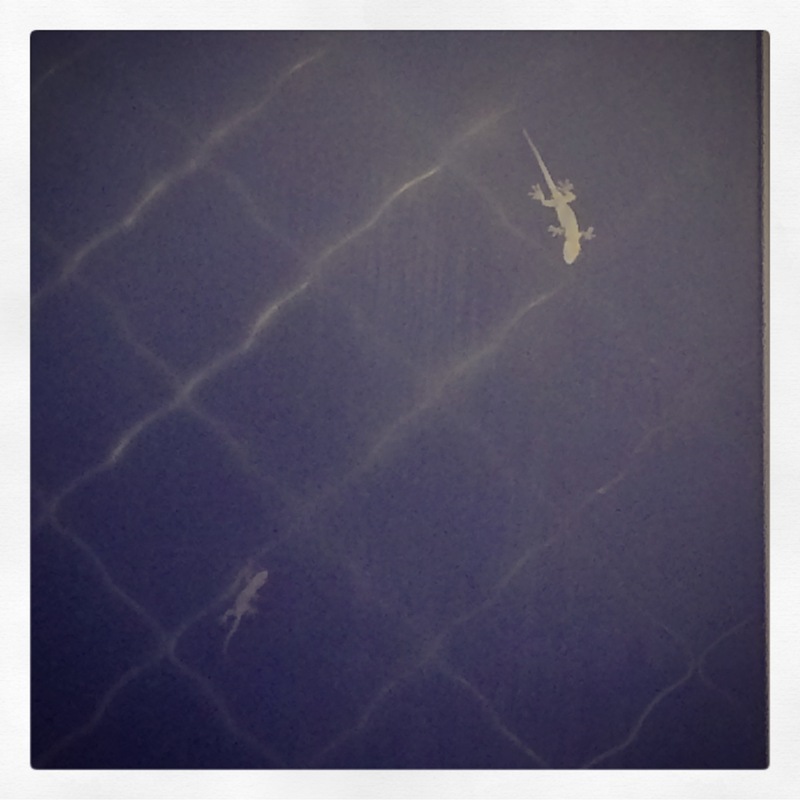 It’s been a while since I last blogged. What’s happening in China these days? Whatever may come, China is undergoing a retrograde change that will require every person, business, and country dealing with it to make a radical reassessment of its willingness to seek convergence with the rest of the world. The notion that the “Mao Zedong Thought” that had dominated the Cultural Revolution would ever make a comeback in China had long seemed as unlikely as it was unwelcome. But now that China is sliding ineluctably backward into a political climate more reminiscent of Mao Zedong in the 1970s than Deng Xiaoping in the 1980s, more and more educated Chinese are making allusions to such frightening periods of Chinese history as the Cultural Revolution and the Ming dynasty. I actually have a related anecdote. A couple of months ago, on my way to work, I was listening in on some old people as they fell into conversation on the bus. One of them started ranting about the Zhongguo meng (the Chinese Dream), telling the others that they can forget about whatever the government was saying today because the government could be saying something else tomorrow. He referred to the ’60s and ’70s. I basically got to hear what every foreigner dreams of hearing, which is a Chinese person trashing the government/party. But even better, he was speaking quite forcefully and loudly in public and had captured the attention of the entire bus. The reaction of his audience ranged from stoic passivity to amused chuckling. I don’t presume to know what Chinese people are thinking, especially because they have been engineered to be hard to read, but I got the impression most people were rather impressed by the old man’s bravery in speaking his mind, as well as in general agreement with him. Such signs of dissent are always exciting. Last month was a particularly great time of rebellion. This month, hardly a word. There’s a cycle to it; it bubbles over and then dies down, always simmering. Still, it is comforting to know that there are people willing to speak out. Not that it is putting pressure on Xi to stop testing the people’s limits, but at least there are limits somewhere. It’s another white Christmas in Beijing, probably the whitest one we’ve had. Usually you can see the towers of the Central Business District in the picture above, but not today! City authorities have issued an orange alert – only the second-highest rating on the smog chart – so it’s not so newsworthy in the eyes of foreign media. And yet, the AQI is “beyond index,” which means it’s beyond hazardous, and almost 40% of the day’s flights had already been canceled by 11 a.m. due to the smog. So why is it a code orange instead of a code red, as it was over the past weekend and first couple of days this week? 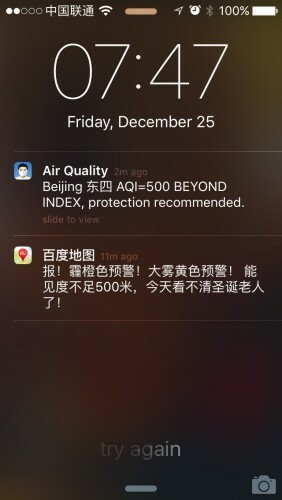 Beijing’s smog alert system is a bit faulty, that’s why. Despite having had a great year of air, the end of the year has so far been terrible. It was embarrassing when Boyfriend’s brother came to visit last month for a long weekend, and the AQI never dipped below 300 and routinely went beyond index. People widely mocked the government for failing to issue a red alert. It worked! A week later, another bout of smog triggered Beijing’s first-ever red alert. Foreign media had a field day with it, more proof of China’s dirty, dirty, failing ways and giant problems. My boss even told everyone to work from home. And yet, in reality, the air wasn’t that bad, relatively speaking. The AQI for the most part stayed below 300, closer to 200, and even dipped below 200 at times. The AQI in Beijing is usually somewhere in the 100s, so the air was pretty bad, but the cold wintery weather probably made it worse. It was a bit worse during the second red alert, but again, the AQI was nowhere near beyond index, as it is today and as it was during that first bad spell of smog that triggered all the red alerts in the first place. Before these two red alerts, red alerts were seen as a somewhat mystical creature. By the government’s own system, red alerts are to be issued 24 hours in advance when there is an AQI forecast of 200+ for three or more days. During a code red, heavily polluting factories and construction sites are shut down, cars are taken off the road under the alternating plate system, and schools are forced to skip classes. An orange alert is issued when the AQI will be 200+ for 2-3 days, and only the heavily polluting factories are closed. 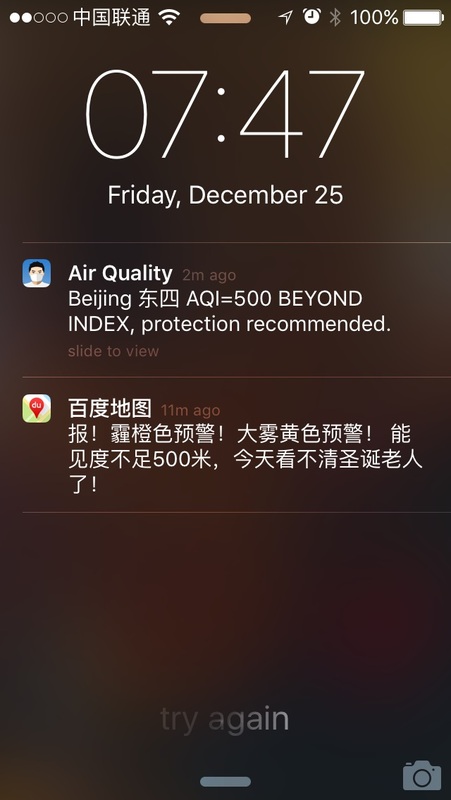 And therein lies the problem with Beijing’s smog alert system. The two most severe alert levels only take into account how long the smog is forecasted to linger, albeit at a pretty low level of 200. But I would argue that a day like today, with reported visibility of less than 500 meters, certainly merits a red alert as well, until the AQI falls below 200 again. It’s been described as psychedelic, groovy and Schoolhouse Rock-ish. Now, I know China is making huge efforts to increase its soft power, mostly by trying to appear modern and culturally relevant, despite the whole antagonistic, authoritarian thing it’s got going on. But if it has to resort to manufacturing soft power, it’s clearly doing something wrong. This isn’t even the first video state media have put out, but it is the one causing me the most secondhand embarrassment. By nightfall of the day of its release, my Chinese friends on Wechat were already sharing articles proclaiming its success overseas, without any apparent awareness of the derision the video was met with. China, man. Sometimes it’s better to toil away quietly toward your goal than to go viral for the wrong reasons. When I applied for my first adult passport, I never thought I would actually go anywhere with it. I didn’t care. 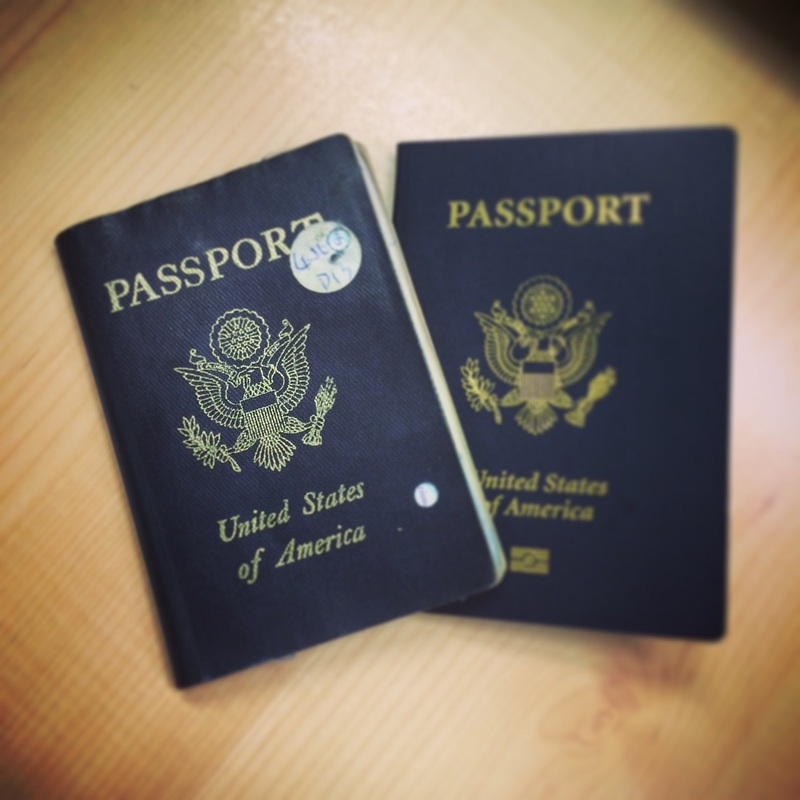 * I flashed my battered passport like it was a badge of my travel cred. I’ve been places, yo. It didn’t help that I had to use it so often within China — signing leases, conducting bank account transactions, booking trains and flights, registering with police, even getting a local phone number. I began taking it with me wherever I went, despite all the travel advice not to. My passport number, issue and expiry dates are seared into my memory. I was one with my passport. * This is a lie; I always got super nervous whenever I needed to present my passport because of the damage. But apparently it’s no big deal because my passport was never rejected. Categorized in: Travels, USA! USA! It’s a beautiful Thursday in Beijing, one of those rare days where the splendor of the outdoors can actually match that of any other beloved city of the world. It’s in the freshness of the air, in the warmth of the sun, and even in the joviality of everyone on the street. People are lining my street outside, excited. Neighbors, bumping into each other, chat happily. Elderly people are lounging on stools and old chairs. Nearly everyone has sought shade under trees or patio umbrellas brought out in the past couple of weeks for the “safety volunteers,” citizen brigades tasked to keep watch. The atmosphere today is in stark contrast to just the evening before, with offices and shops closing abruptly and workers frantically rushing home before the buses stopped running. As I biked home, the roads felt eerily empty, prepped for closure and cleared of the usual parked cars and congested traffic. Boyfriend left for work early this morning, earlier than usual. While today has been declared a national holiday, he will be working until late tonight. That’s the importance of the parade. I watched the parade via a VPN-enabled FaceTime call with my sister, who was visiting my parents, who have CCTV. I didn’t intend to watch it, but the parade had become some kind of omnipresent beast that was impossible to escape. It was also taking place along a street that is literally two giant blocks from me. Despite finding the whole parade concept incredibly tacky, I couldn’t help being taken in by the awesome precision, coordination and number of soldiers marching. And the excitement of my neighbors was contagious. I went outside to see if I could spot the planes flying overhead (yes!). Military parades, especially ones that roll out some major weapons from the arsenal, must appear quite unusual to Westerners today — even Americans, who spend more on defense than the next seven countries (including China) combined and who have an unhealthy pride in their military achievements. They are, to us, a spectacle bordering on histrionics, a bombastic display of bravado that, in a post-WWII era, is reminiscent of the nationalistic and aggressive dictatorships we fought. It is hard not to see China as being antagonistic, despite its repeated assurances that the parade — and the Chinese — was all for peace. To understand how a military parade can be a display of a country’s desire for peace requires the application of Chinese logic. That, or a ruthlessly realist outlook on geopolitics. China’s definition of peace is a world that goes about its own business, too afraid to mess with it. But my dad said something while we were admiring the synchronization of the goose-stepping brigades: A marching army, perfectly in sync, is more than just about looks. To have hundreds of men concentrating on a single task, which is to march in lockstep, because one man said so, is to have complete control — that is power. To hang banners and posters all around the city, even replacing the ads of perennial bus stop advertisers H&M and Apple with 70th Anniversary posters — that is power. To close hundreds of factories and leave thousands of workers idling for a whole month — that is power. To basically shut down a city of 20 million for the sake of a three-hour event — that is undeniably power. Look at my power, Xi Jinping is saying. I have nukes. But who is he talking to? Foreign countries — especially Japan — have certainly gotten the message. But then there is that whole peace talk, so no one is really sure what to believe. The military itself might be the real answer. Xi’s anti-corruption campaign had brought down two of the PLA’s top-ranking generals, among dozens of other generals. The parade was an exercise for the remaining generals to salute Xi as he stood atop Tian’anmen so that he could assert his control over the bloated institution. In this respect, the parade was really to rally the military around Xi, and the people around the military. Indeed, the people are rallying. The parade has given them a chance to marvel at how far their country has come since they were so weakened by foreign powers that Japan — Japan! — invaded and ravaged their country. It was a chance for them to share their family’s war-time stories and a chance to thank their veteran heroes. That is why everyone on the street, usually so stoic and neutral, was so happy today, despite their street being closed down and under heavy surveillance. It was, in all fairness, a great day for the country. Still, as I watched all the different types of tanks that I just saw on TV rolling down my street, in an encore performance for the everyman, I couldn’t help but think of the irony. A parade ostensibly meant to commemorate peace and victory over anti-fascism, but proudly displaying the destructive weapons of war. People lauding the show of power, without realizing it is the same power that has placed so many limits on them. The soldiers, peaking out from the turrets, didn’t even smile or wave. This is the weather forecast for Beijing. 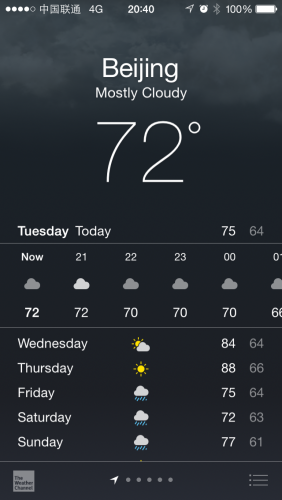 It’s been rainy and overcast for the past three days, and according to the forecast, it will be cloudy tomorrow as well. It can’t be a coincidence that the only sunny day this week will be the day of the parade, can it?